After a card game Southerner Owen Pentecost finds himself the owner of a Denver hotel. Involved with two women - one who came with the hotel, and one newly arrived from the East to open a dress shop - he then has to make even more fundamental choices when, with the start of the Civil War, he becomes one of a small minority in a strongly Unionist town. Even big men cry sometimes. Great Day in the Morning is directed by Jacques Tourneur and written by Lesser Samuels. It stars Robert Stack, Virginia Mayo, Raymond Burr, Ruth Roman, Alex Nicol, Leo Gordon and Regis Toomey. Music is by Leith Stevens and cinematography by William E. Snyder. 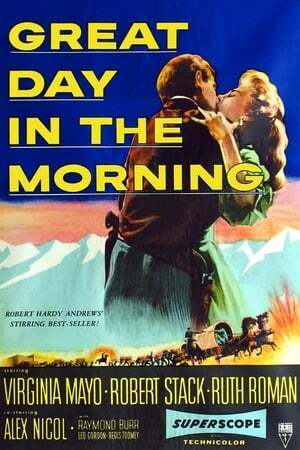 This would turn out to be the great Jacques Tourneur's last Western offerin... read the rest.